TWG: THANK YOU, GARY MARBUT! HELENA, Mont. 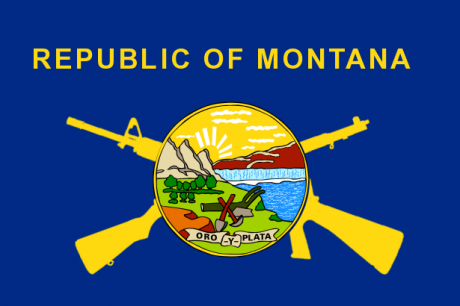 (March 20, 2013) – The Montana House today concurred with the State Senate on a a bill prohibiting state compliance with any federal attempt to enforce a ban semiautomatic firearms or high capacity magazines in Montana. The vote was 62-35. The House previously approved HB302 by a vote of 56-42. And last week the Senate approved with with an amendment, 28-21. The House had the option of approving the amended version of the bill or sending the original back to the Senate. Inside sources indicated that the Senate was prepared to vote down the original bill which would have included a provision dictating to the county attorneys of the state how to handle violations of the act. An employee of the state or any political subdivision may not expend public funds or allocate public resources for the enforcement of a federal ban on semiautomatic weapons or large magazines. Any expenditure of public funds or public resources, including paying the salaries of personnel, to enforce or participate in the enforcement of a federal ban on semiautomatic weapons or large magazines is an unauthorized use of public resources and is considered theft as provided in 45-6-301. The so-called ‘war on drugs’ illustrates federal dependency on the support of state agencies in enforcing its laws. Federal agencies almost always act in cooperation with state and local law enforcement. In many situations, federal agents have absolutely no way to carry out enforcement without massive state and local support. If a large number of states simply refuse to cooperate with federal gun bans, it will effectively nullify the law. Without state compliance and assistance, many unconstitutional federal acts are little more than a house of cards. Refusing compliance on a state or local level is a big deal – and it sets the stage for others to do the same. Earlier this week, Judge Andrew Napolitano supported this position when on Fox News he said that state noncompliance with federal gun control would make it “nearly impossible” to enforce. More than two dozen states have introduced legislation to nullify federal gun “laws.” – and Montana is leading the way as the first state where both houses have approved such a bill. 1. Call Governor Steve Bullock. A phone call will have far more effect than an email. Let him know that you want him to SIGN HB302 when it reaches his desk. Strongly, but very politely, make sure he knows that you want him to do the right thing – principle not party – and make sure that Montana will not be a part of unconstitutional federal bans. If you would like to see model legislation to introduce in your state or local community to nullify federal firearm laws, please see The Tenth Amendment Center’s Model Legislation: The 2nd Amendment Preservation Act. Track the status of 2nd Amendment preservation legislation in states around the country HERE. In an op-ed published in The Daily Caller on February 23, Gregg Re repeats the all-too-common understanding that the overrated Supremacy Clause of the U.S. Constitution makes the federal government supreme in virtually anything it wishes to do. That Gregg would hold such an opinion is no big surprise. It’s what he and most everyone else were taught in high school. Fortunately, I have learned since high school that this view of the Supremacy Clause is not only wrong; it is dangerous to people and to individual liberty. Montana moved a step closer Friday to declaring that local sheriffs are the supreme law of the land and trying to nullify any federal crackdown on assault rifles. The measures were among a slate of gun rights bills that cleared the Legislature’s House Judiciary Committee and now head to the House floor. Other measures that advanced would let college students bring guns on campus, allow high school students to leave guns locked in their cars, and clear the way for nearly anyone to carry concealed weapons without a permit. Several of the bills met with staunch opposition from Democrats. The so-called “sheriffs first” bill says federal agents must get a sheriff’s permission before making arrests or serving warrants — or risk local kidnapping or trespassing charges. If the bill clears the Republican-controlled House and Senate, it would go directly to voters in 2014. The direct referendum would avoid the potential veto pen of Gov. Steve Bullock, a Democrat. The measure was opposed earlier in the week at a hearing by local law enforcement agencies, and critics have said such a measure most certainly would face a legal challenge. Opponents, led by Democrats, warned it would threaten the effectiveness of cooperative task forces tracking violent crime and drugs. Another bill that cleared committee would bar police from enforcing any federal bans on assault rifles or high-capacity clips. Supporters said it’s necessary to protect gun rights in Montana. Opponents, who called it an extreme piece of legislation, argued the bill also violates the U.S. Constitution granting the federal government supremacy in such matters. The panel also advanced a measure allowing the use of silencers while hunting big game, and removing the potential penalty of disturbing the peace for the discharge of a firearm. Below is a letter from Gary Marbut, Founder and President of the Montana Shooting Sports Association, dated January 8, 2013, which lists bills introduced and an explanation of each bill. GETTING THESE BILLS PASSED WILL REQUIRE YOUR HELP. up zero current tax income to the state but would provide jobs for Montana. opposition to that level of funding. consideration any firearm locked in a vehicle in a school parking lot. that firearms locked in a student vehicle does not mandate expulsion. the accused is found not guilty. from the disorderly conduct statute. passed by the Legislature in 1995, but was vetoed by the Governor. for how long law enforcement officers may disarm citizens. restrict firearms on U. system campuses, and then gives back to the U.
McDonald) and state (Colorado, Oregon and Utah) court cases. “silence” firearms, but suppress somewhat the noise of the muzzle blast. chase” hunting with absolutely silent arrows during archery season. in managing and controlling wolves. the right to privacy to themselves in the Montana Constitution. except for law enforcement purposes. aiding in enforcing any such new federal gun control. TWG: If you support our Bill of Rights and specifically our Right To Keep and Bear Arms, please do your part and re-send this letter to your Representatives in Congress and in your State Government. hunting rifles, and military “assault rifles,” which are machine guns virtually unavailable to the public since implementation of the National Firearms Act of 1934. The modern rifles Senator Dianne Feinstein has, by her own admission, waited decades to ban differ from others primarily by cosmetic features such as barrel shrouds, threaded barrels, flash suppressors, pistol grips and adjustable stocks – things which do not affect function. The notion being promulgated by gun control advocates that such features increase lethality by allowing guns to be “fired from the hip” is absurd: Any firearms expert will attest that rifles can only be effectively utilized from the shoulder. but instead for light weight and low recoil. transaction records in violation of the Brady Act, creating a defacto national registration system. the scheme, if implemented, will make felons of otherwise law-abiding citizens. most recent for which data is available (2011), violent crime dropped by 17% and homicide, by 15%. What does appear to have impacted school shootings was implementation of the latest version of the “Gun Free School Zones Act” (GFSZA), which is associated with a dramatic increase in school murders. While media summaries may not be comprehensive, the GFSZA has clearly been an abject failure. Worse, evidence suggests it may actually create “kill zones” which attract violent predators. Some will urge you to “compromise,” perhaps even the National Rifle Association. The many thousands of gun rights supporters represented by the Coalition, however, regard “compromise,” as our opposition defines it, to be a process in which we lose slightly fewer of our rights than under the original proposal. Consequently, any legislation which registers or bans firearms; limits magazine capacity; registers private transactions through NICS; or restricts time, place or manner of self-defense is unacceptable. Gary Marbut’s phone is ringing all the time these days with calls from national news organizations, along with lawmakers and citizens. As some gun rights advocates call for increased firearms control, and others clam up entirely, Marbut is the go-to guy for quotes about maintaining the status quo or – better yet, he’d say – loosening gun regulations. Marbut is hardly alone in opposing gun-free zones. But for the past few days he’s been largely on his own as a gun advocate speaking openly about his positions in the aftermath of the shooting at a Newtown, Conn., elementary school that took the lives of 20 children and six adults. The National Rifle Association took down its Facebook page after the shooting. The page went back up Tuesday, with a statement from NRA President Wayne LaPierre saying “we have given time for mourning, prayer and a full investigation of the facts before commenting,” and adding that the NRA will offer “meaningful contributions to help make sure this never happens again.” Pierre promised a “major” news conference Friday. On Tuesday, it expanded upon that, pointing out that in a small community like Newtown, “not suprisingly, we had family, friends and acquaintances that were affected. We are weighed down by their heartbreaking stories and the sorrow that has blanketed our community.” That statement reiterated the group’s decision not to publicly discuss the issue. Marbut said Tuesday that three issues require focus in the aftermath of the Newtown massacre: Perspective. Armed teachers. And gun-free zones. He’s strongly in favor of the first two, and just as vehemently opposed to the last. In terms of perspective, he likened the odds of a child being injured by “an insane active shooter” to being hit by lightning. In 2011, 240 people were injured by lightning and 39 died, according to the National Weather Service. This year, the shootings in Newtown, at a Christian college in California and at a school cafeteria in Oregon killed a total of 36 people. Marbut suggested that people concerned about protecting children might, “in a more rational world,” want to focus on the far greater risks posed by automobiles and water, he said. The Centers for Disease Control lists accidents as the leading cause of death for people ages 5 to 24. The second-leading cause for those ages 5 to 14 is cancer; for 15- through 24-year-olds, it’s homicide, according to the CDC. As for arming teachers – and Marbut stressed that should be on a volunteer basis only – “if we believe that the potential for crazy people to shoot up schools is a genuine risk we need to address, then the rational way to do that … is to allow, through public policy, teachers who are willing to undertake the responsibility” to carry. On Monday, Virginia Gov. Gov. Bob McDonnell, R-Va., told a local radio station that a discussion is needed on arming teachers. That was his first reaction. His second? Reporter Gwen Florio can be reached at 523-5268, gwen.florio@missoulian.com or @CopsAndCourts.